Is there graffiti on your facade? Or is the masonry due for some maintenance? Facades are sensitive to the pollution in the atmosphere, which can cause your office building to look unattended. Facade erosion, moss, damp spots, frost damage, salt deposits, pollution from acid rain and exhaust fumes and accretion of other dirt are the most common defacements. 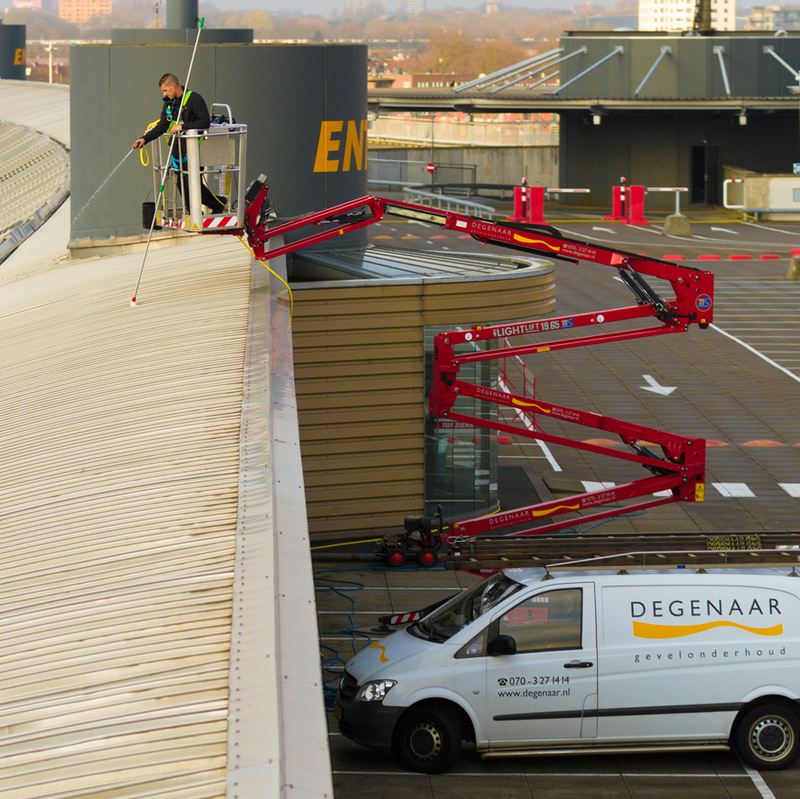 Degenaar Gevelonderhoud has been providing facade maintenance for over 35 years. We clean and preserve masonry, concrete facades, aluminium or synthetic elements, replace graffiti and apply a coating to the facade to protect it from the next spray can. In short, we make sure your facade is looking fresh for a long time to come. There are many types of facades and facade elements: brick, concrete, glass, wood, metal and synthetic material. Each facade requires a different approach. The methods most often used for cleaning are spraying, steaming and high-pressure cleaning. Moisture is one of the most important causes of concrete damage and quality loss in masonry. In order to make a facade moisture-repellent and dirt-repellent, we have the option of coating it, painting it, or hydrophobing it. A hydrophobic facade remains dry, so the masonry is less easily polluted and because of its higher insulation value, can better withstand frost damage. Graffiti can really deface a building and you want this ‘art’ removed as quickly as possible. Degenaar Gevelonderhoud can do this for you professionally. We make use of as few environmentally harmful cleaning agents as possible, by using the hot water technique, for instance. Working off the ground means safety first, and all safety regulations will be heeded. Our employees are all trained to do this. We are VCA-certified and have completed the SVS window cleaner training. 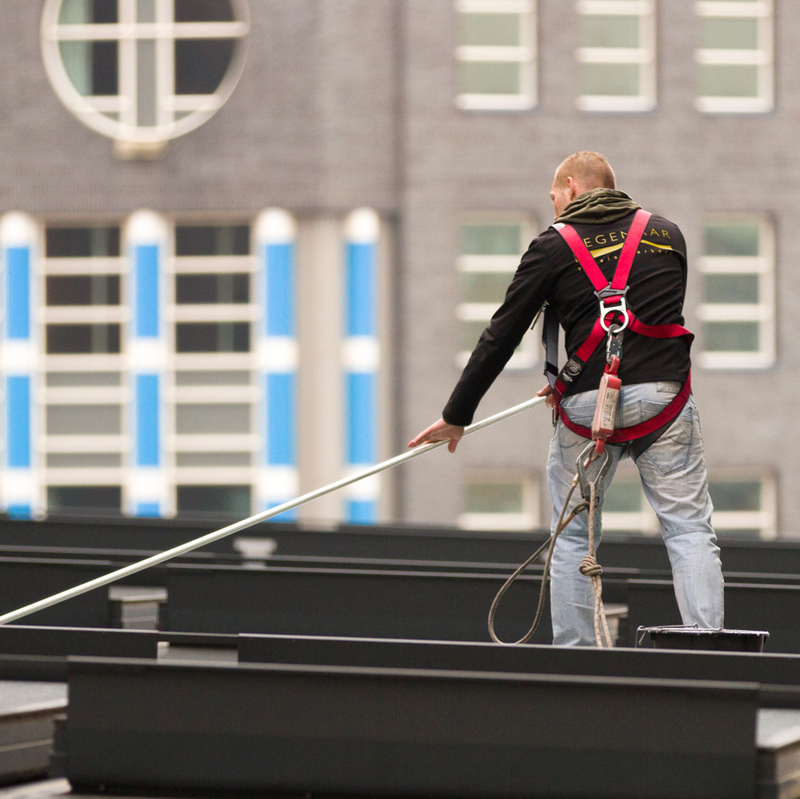 For each building we assess the working method(s) and determine which safety precautions must be taken. Naturally, all our work is carried out in compliance with health and safety regulations. We also make sure all our materials meet required standards and are inspected every year. We typically work under contract, but incidental assignments are also an option. We have all the knowledge and experience to help you make a multi-year maintenance plan (MYMP). This can include both periodic window cleaning and maintenance of other facade sections. Think for instance of cleaning and preserving window constructions, or cleaning your facade and making it moisture-repellent. A structurally maintained facade can save you a significant amount of money.